Kindred Combination LH 20 Ga sink 3 hole drilling - 20-9/16" X 27-1/4" X 8"
Combination bowl 20 gauge stainless steel topmount sink. Small bowl, left hand position. Includes faucet ledge with 3 one faucet hole drilling. Rear drains to allow for more storage below, easy care satin finished bowls . Sink is shipped complete with one CA1W colander and waste fittings and is backed with a Limited Lifetime Warranty. Premium 18 gauge stainless steel topmount round vanity basin. Sink features front overflow, silk rim and bowl for bright and shiny good looks without sacrificing on ease of cleaning, and 1.25" waste hole. Waste fitting is not included. Makes an excellent powder room sink on its own, or when paired in an expanse of solid surface in a master ensuite. Premium 18 gauge stainless steel top mount vanity basin. Sink features large oval shape, rear drain for more storage below, front overflow, rear faucet ledge with 3 hole drilling with 4" centres, silk deck and bowl for bright and shiny good looks without sacrificing on ease of cleaning, and 1.25" waste hole. Waste fitting is not included. Kindred Combination RH UM 18 Ga sink - 18-3/4" X 32-7/8" X 9"
Premium grade 18 gauge stainless steel, combination bowl sink, featuring small bowl right hand position, rear drains for more storage below the cabinet, easy care silk rim and bowls, and waste assemblies included. Bowl bottoms are creased and bowl is sloped to center of wasteshole to ensure efficient draining. Kindred Single sink 20 Ga - 18-1/8" X 16-1/8" X 8"
Compact, single bowl 20 gauge topmount rimback sink. Sink features hard wearing satin finished bowl, sparkling mirror finished rim, and included waste fitting. Quality assured with the standard Kindred Limited Lifetime warranty. A great chioce for small spaces where you still require a full bowl size. 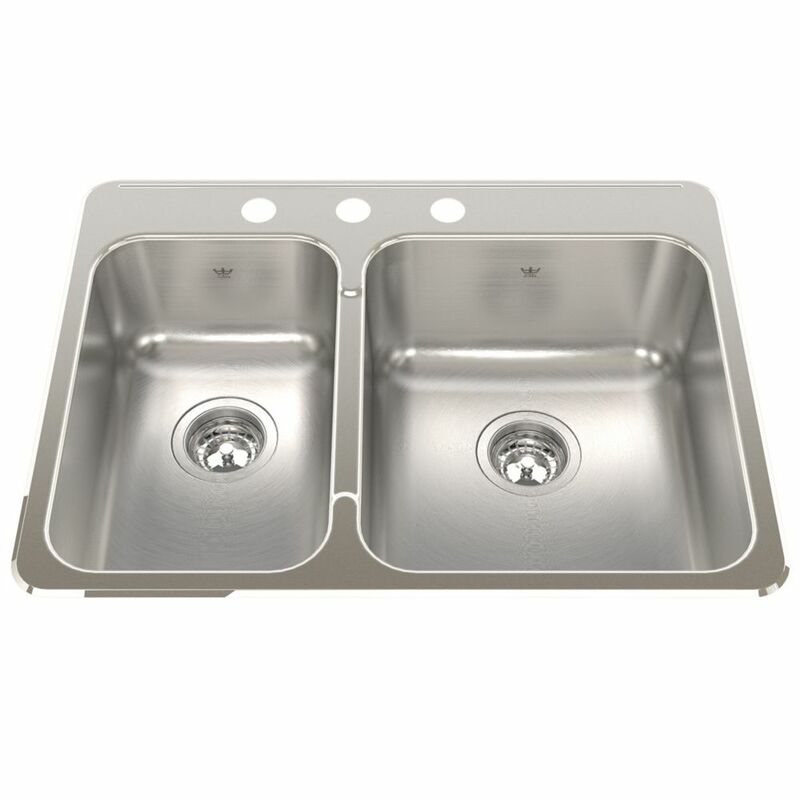 Combination LH 20 Ga sink 3 hole drilling - 20-9/16" X 27-1/4" X 8" Combination bowl 20 gauge stainless steel topmount sink. Small bowl, left hand position. Includes faucet ledge with 3 one faucet hole drilling. Rear drains to allow for more storage below, easy care satin finished bowls . Sink is shipped complete with one CA1W colander and waste fittings and is backed with a Limited Lifetime Warranty.